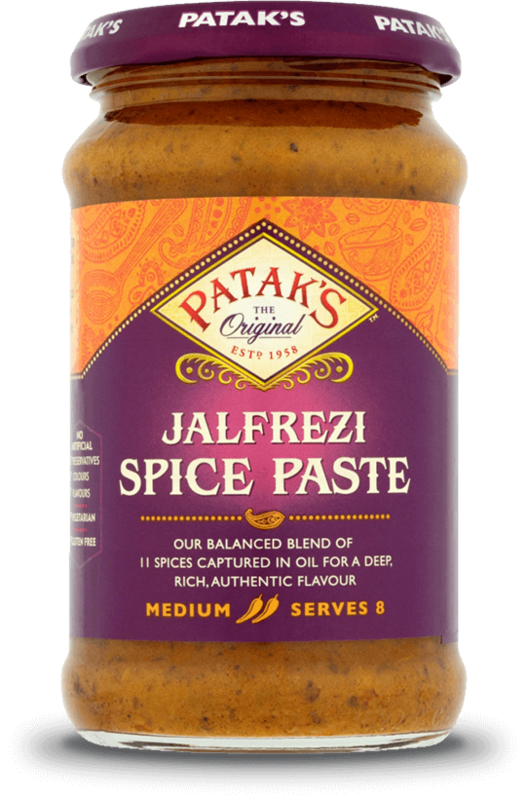 Our authentic blend of aromatic spices, coriander, paprika & coconut for a beautifully balanced Jalfrezi dish. 1. Heat oil in a deep frying pan and crackle dried red whole chilli, and dried coriander seeds. 2. Add sliced onions and cook until golden brown and soft. 3. Add chopped ginger, sliced garlic, crushed dried red chillies, Pataks Jalfrezi Spice Paste and 100ml water. Cook on a medium heat until water is evaporated. 4. Add tomato paste and add tinned tomatoes and cook for 3-4 minutes, or until there is oil separation on the side of the pan. 5. Add Paneer, thick sliced onions and peppers, mix well, cover the pan and cook on simmer for 5 minutes. 6. Add sugar, fresh chopped coriander and salt to taste and serve hot.